It’s a dangerous world out there, if you can see it. Not everyone can. You have to relax your eyesight, let everything go softly out of focus and look beyond the glamour. That’s the masking spell. It hides everything the Shadowhunters don’t want the mundanes to see. Shadowhunters? They are Nephilim, the offspring of humans and angels, created by the Angel Raziel when the human world was overrun by demon invasions from other worlds. Shadowhunters are sworn to protect the human race. Of course there are great Shadowhunter families now but if too many are lost through battle it is possible to create more Shadowhunters. You need the Mortal Cup. And you need to mix the blood of an angel with the blood of a mortal and give it to the mortal to drink. It’s still not easy to kill demons though. Shadowhunters train from the earliest age to fight with weapons and without. And they wear the protective iratzes when they go out hunting. An iratz is a mark like a tattoo which they draw on their bodies. It can offer temporary protection from injury and endow the wearer with temporary powers. When the power of the iratz wears off just the faintest scar remains on the body. There it was: the true vision, glowing through the false one like light through dark glass. She saw the soaring spires of the cathedral, the dull gleam of the leaded windows, the brass plate fixed to the stone wall beside the door, the Institute’s name etched into it. She held the vision for a moment beore letting it go almost with a sigh. You’ll be wondering how come Clary can see through glamours. She is definitely a mundane. Most likely. Maybe. Well, no, in fact, she isn’t. She’s a Shadowhunter too but her mother has hidden her, protected her, brought her up as a mundane. That’s because Clary has an important part to play in a terrible, deadly rift that has opened up in the Shadowhunter world. The Mortal Cup is lost. It is urgently sought by both sides...by the dangerous but charismatic rogue Shadowhunter Valentine, and by the Clave, the official Shadowhunter council. Clary, she may be small but she is indomitable. And she is utterly loyal. She’s swept along by supernatural events but she never forgets her friends or her family and she moves heaven and earth to keep them safe. 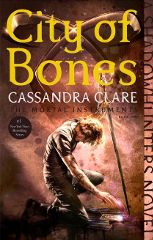 I loved every single character in this book and there are all sorts: Shadowhunters, mundanes, vampires, werewolves, faeries. They are all flawed. They make mistakes, misjudgments and they change their minds. But all that, it just makes their successes even greater. Shadowhunters have a saying: all the stories are true. There’s more, but you can find out the rest for yourselves.